The purpose of Team Spirit is to promote safe driving in our community by increasing the usage of seat belts and eliminating texting while driving. It also promotes teen mental health and emotional wellness, and support for adolescents who are struggling with isolation, depression or being victims of bullying or domestic crisis. Beginning in 1991, Mothers Against Drunk Driving (MADD) took a lead role in sponsoring Team Spirit. They have continued that commitment to Team Spirit by making it a part of MADD's Youth Program. Set at the First Meeting. Fundraising efforts include participation in Jr./Sr. Conference PSA competition. 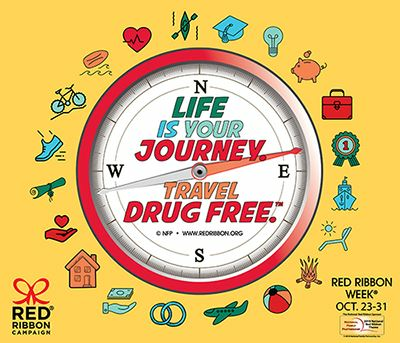 Red Ribbon Week began after the kidnapping, torture, and murder of DEA agent Enrique "Kiki" Camarena in 1985. Camarena had been working undercover for Guadalajara, Mexico for over four years. His efforts led to a tip that resulted in the discovery of a multimillion dollar narcotics manufacturing operation in Chihuahua, Mexico. In the decades since, Red Ribbon Week has become a national awareness program for the prevention of substance abuse. If the demand is eliminated, then so will the waste of American potential and lives. Each week committee members will be focusing on sharing some love with a different grade level via notes on their lockers. For the entire month teachers and students may fill out (or request to fill out) a kindness card in which they write the name of the student who was caught being kind and what they are doing. These will be used for a drawing at the end of November. Students may be caught doing something above and beyond for someone ekse by showing love, service, compassion, and kindness. SVHS juniors and seniors, along with Perryville High School and Saxony Lutheran High School, will attend a conference sponsored by Perry County Task Force at the Perry Park Center to review vehicle safety and responsibility. Survey our students on "buckling up" (one per semester). Provide this data to our health and safety units. Publish the "Buckle Up" message throughout our community with signs and electronic billboards with our local businesses. Have periodically assemblies within our school to promote "Buckle Up" and "No Texting While Driving" messages. Contact local businesses and have them promote seat belt safety and no texting and driving on electronic billboard signs during Red Ribbon Week. Involve the Mayor and City Administrator to help us expand the messages in our streets and ask for their support on certain school events involving our local safety units. Involve our high school students spreading the messages to our elementary school and visit their classrooms. The leading cause of vehicle accidents in the United States is now distracted driving, surpassing impaired driving as the most dangerous behavior as a driver. Our jobs as drivers is to DRIVE. Do not try to multi-task-- choose a designated texter in the car to take charge of your cell phone so that you are not tempted. If you are alone in the car, put your cell phone AWAY, or if you must, operate it with blue tooth so that you are hands-free with your phone and keeping both hands on the wheel. Be safe. DRIVE to ARRIVE ALIVE!